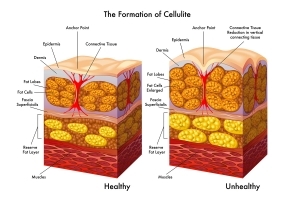 Age is certainly part of the cellulite equation as we grow older the skin loses the ability to stretch, becomes less elastic, as skin thins out cellulite becomes more visible. We use the latest technology in cellulite treatment, our procedure combines with rollers and suction to soften the fibrous band of connective tissue that causes the dimpling appearance. Our treatment massages the skin and applies suction to create a vacuum that helps loosen and release the accumulated fat cells that cause cellulite. Turns the unhealthy tissue into healthy tissue. Your figure can improve dramatically getting rid of fatty deposits, helping with cellulite and toning your skin. Lymphatic drainage vacuum massage increase the functioning of the lymphatic system and helps to remove and filter waste toxins and excess fluids from the body. Good lymph circulation prevents the fluid from solidifying and binding with collagen fibers of the fat cells. 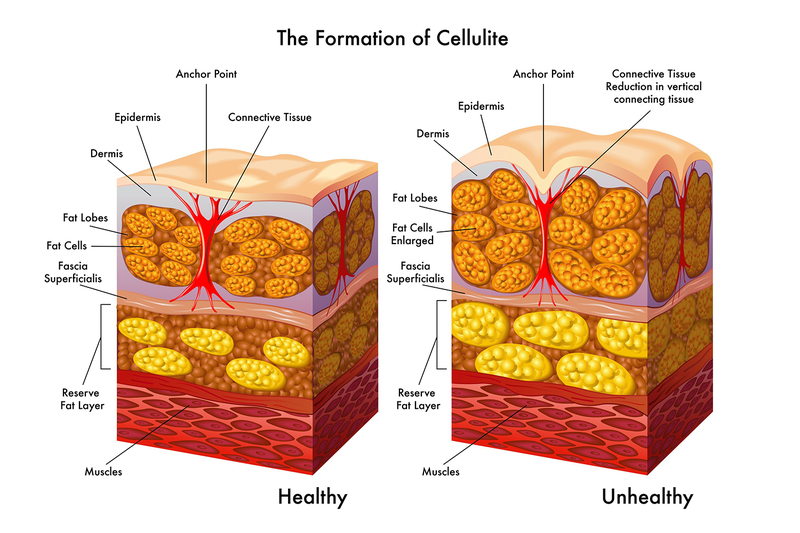 Radio frequency for cellulite reduction is able to change the shape of fat cells and shrink and remodel the connective tissue. Dermal heat enhanced blood circulation helps drain trapped fatty deposits and toxins therefore reducing the appearance of cellulite. Using the energy of acoustic waves, achieves some of best results in cellulite treatment. Drink plenty of water – hydrating the body keeps our skin looking fresh and renewed which can reduce the appearance of cellulite. Eat healthy – fruit and vegetables will keep your weight down and reduce the appearance of cellulite. Eat healthy fats – omega 3 essential for healthy skin, stimulates collagen production, reduces inflammation which helps to reduce cellulite. Lose body fat - exercise routine, when your muscles do not get the proper stimulation then they get atrophied – flat, mushy and droopy, the result is the skin on top of your muscle layers does not hang right and you get the appearance of bumps and dimples. Targeted exercises which tone up,lift and firm the muscle fiber is the answer.